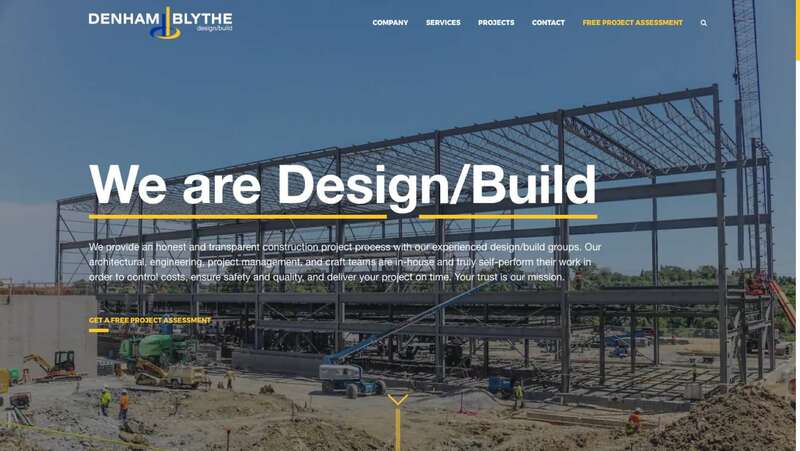 Denham Blythe is a design build contractor located in Lexington, Kentucky. True problem solvers, they do everything in house (“True Design Build”). Repeat customers are vital to the company, but they want to attract more new customers and new markets–making the website a key contributor to their growth strategy. It became clear during our strategic exploration that everyone claims they do “design build.” That makes it hard for customers to understand what it is or why it’s important. So the first task was to simplify the message: We do all services in house so we are faster and less expensive than someone who uses outside design services. They have great photography and striking projects so the company was eager to share its client successes. Users can find their industry in a snap through an industry filter. And organic search engine rankings should be on the rise, thanks to search engine friendly content. Process shows credibility--and predictability. Our Message-Based Design approach helped them outline their capabilities in a simple, tried and true, five-step process. Denham Blythe offers a full proposal in a blazing four weeks (versus several months for its competition). If you need your project estimated and started in a hurry, DBC is your go-to contractor.